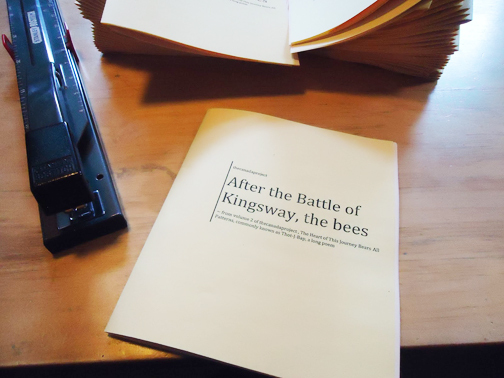 Surrey’s Poet Laureate Renée Sarojini Saklikar’s latest chapbook ‘After the Battle of Kingsway, the bees’ was a shortlisted for the 2017 Nichol Chapbook Award. The poems are from volume 2 of thecanadaproject, ‘The Heart of This Journey Bears All Patterns’, commonly known as Thot-J-Bap. The series is Saklikar’s lifelong poem chronicle. This poetry is experimental, its meaning isn’t so much understood as it is felt and sensed; a special kind of magic. The poems are interspersed with bee imagery and terminology, which feels a lot like having a bee dart out in front of you while you are walking. It can be a bit jarring at first, then curious, with a final transformation into the familiar. To read some of her poems is to feel as if you’ve had access into a waking dream of the collective unconscious. Please enjoy one of the poems from After the Battle of Kingsway, the bees. You can access this poem through the LITERARY PORTAL featured above.